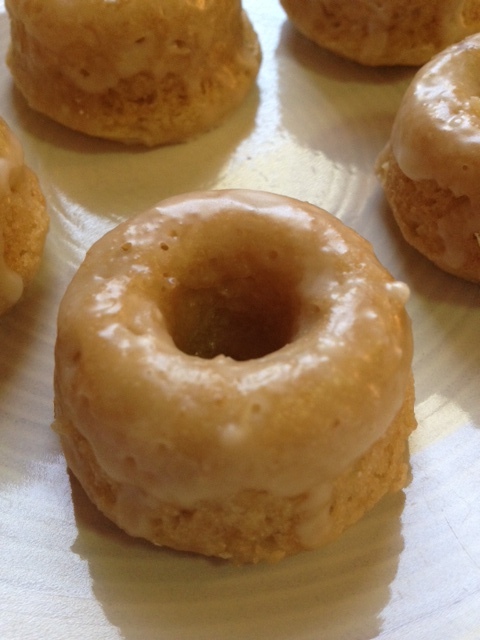 Find the recipe for vanilla cake donuts here. Bake at 325 degrees for 14 minutes. 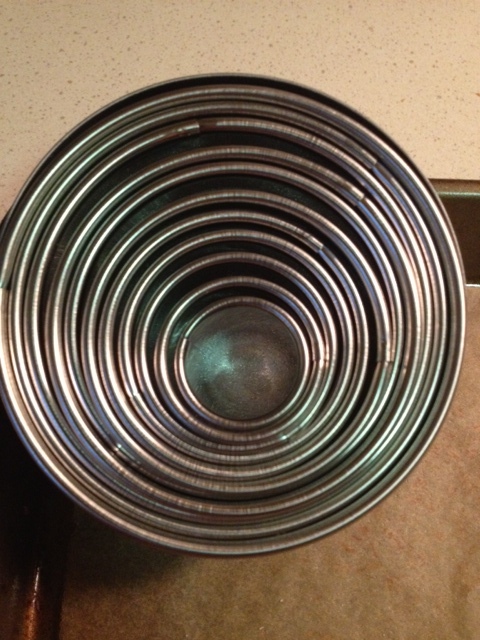 Let cool for 5 minutes then remove top of pan and let sit for another 5 minutes before removing from pan. Since I wanted a variety of "Munchkins", I made half the batter vanilla and then took the other half of batter and made them chocolate by adding 1/4 cup of cacao powder to the mix and 1 more tablespoon of applesauce. 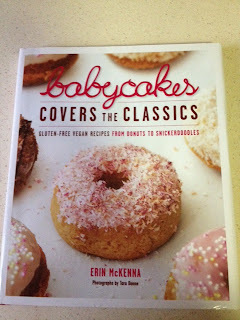 You can also find Babycakes NYC chocolate cake version in this book. For more about Babycakes NYC visit their web site here. For the vanilla Icing, I mixed 1 cup of Powdered Evaporated Cane Juice with a tablespoon of water and a teaspoon of vanilla to make a glaze. If it gets to thick, add a little more water to thin it out. 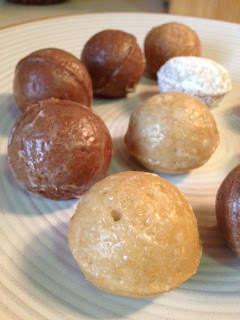 For the powdered ones I just used Powdered Evaporated Cane Juice and rolled the "Munchkins" in it. 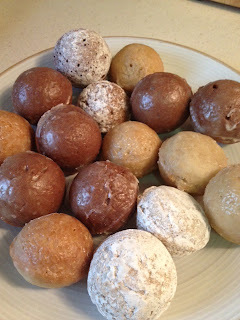 These also make really good mini donuts. Just add the batter to a mini donut pan and bake for 14 minutes. Before going gluten free I had been known to make a meal out of bread. Well, bread, olives, hummus, etc. I could eat bread everyday. I always had digestive issues but never thought it was the gluten. The more bread I ate the more uncomfortable I was. I cut out gluten and felt better, I also found out I was allergic to yeast which the bread was not helping with. I didn't miss the bread all that much because I knew it would lead to stomach discomfort. Every so often, I get this urge for a really good loaf of bread. 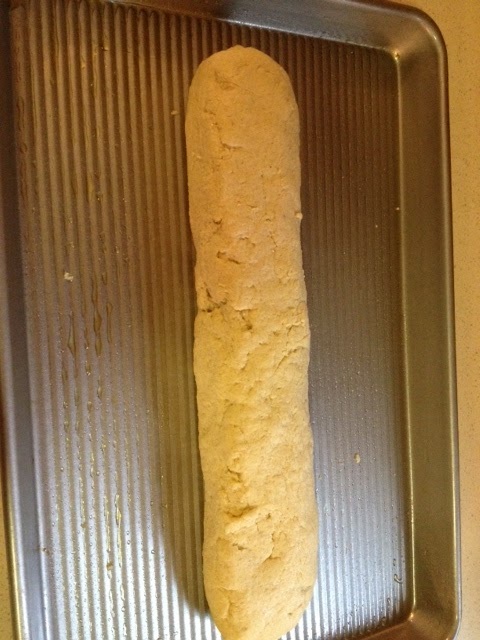 Until now, I did not have one that was gluten free but tasted good enough to satisfy the craving, I did try some gluten free baguettes but they usually contain yeast and any recipe I tried that didn't have gluten, dairy or yeast was not that good so I just rather do without. If I'm not going to thoroughly enjoy my food when I eat it, I'm going to eat something else that I enjoy. 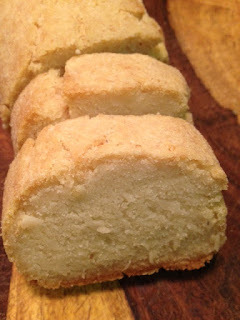 When I saw this Easy French Bread recipe from Iris from The Daily Dietribe's 5-Ingredient Monday's I had to give it a try. It was gluten, yeast and dairy free and looked amazing. I doubled the recipe and made two loaves one using the white rice flour as the recipe calls for and another loaf using millet flour. Do yourself a favor and don't do this! The millet version was not good. This was easy to make and came out really good. What I really liked is how simple it was to do. It took about 15 minutes to make the loaf and then 40 minutes in the oven. Certain times I really need to have bread ready on short notice, like when we are going to a restaurant and my kids want bread when everyone else has it. This would be great to whip up in 15 minutes and let it bake while you are getting ready to go out. Then it will be ready to go with you. I used this recipe with rice milk and olive oil. Grease a baking sheet with olive oil. Mix your milk and apple cider vinegar in a bowl and set aside for a minute. 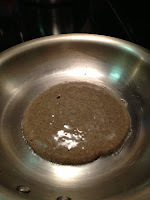 Add the psyllium husk and set aside for 5 minutes. While your waiting mix together your flour, baking powder, baking soda and salt. Add your oil and applesauce to your wet ingredients and stir. 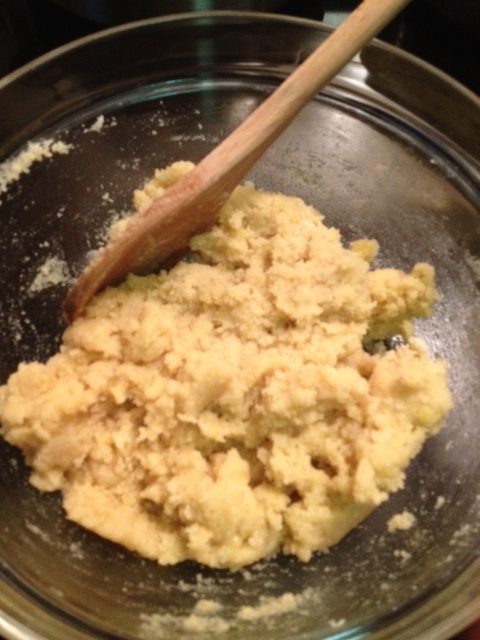 Add the wet ingredients to the flour mixture and start to stir until it begins to form a crumbly dough. Start kneading with your hands until a smooth dough forms. 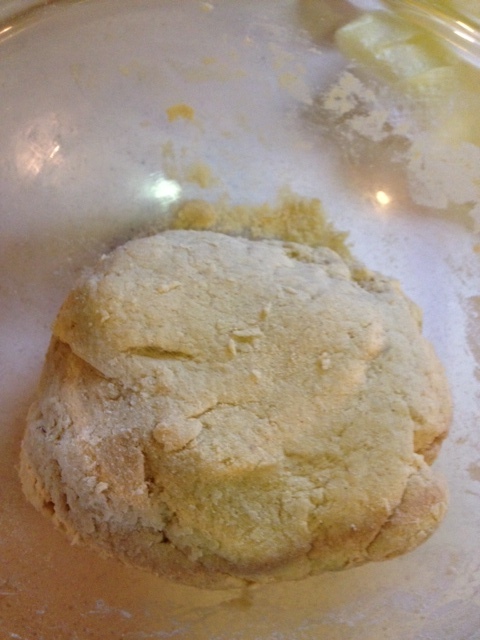 (It was very crumbly and I started to worry that something was wrong, but keep kneading and it comes together just fine). 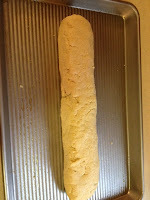 Shape into a baguette and lay on baking sheet. Brush top with olive oil and bake for about 40 minutes until lightly browned. 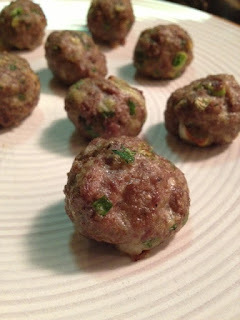 These meatballs are perfect as appetizers or for a main course on top of salad. There is so much flavor in these, that you can eat them just the way they are. My one year old loves these. He is now at the age I can hand him a small item and he will walk around and take bites. I gave him one of these, and he ate it so fast and came running back for more. This recipe was inspired by this recipe from The Urban Poser. Preheat oven to 350. Line two baking sheets with parchment paper. Add all ingredients to a bowl and mix together until well combined. 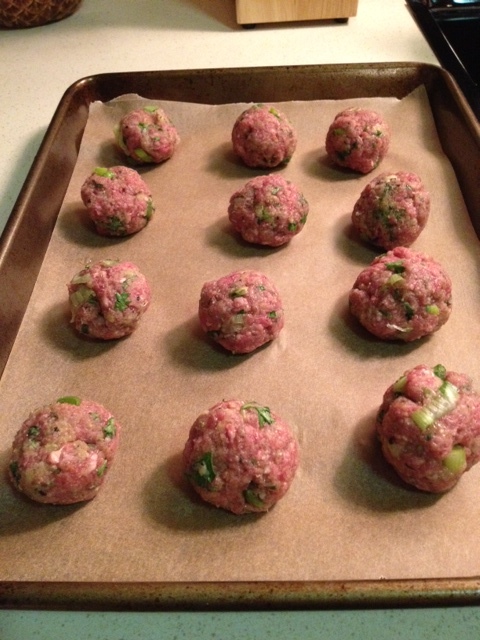 Roll into golf ball size meatballs and place on parchment lined baking sheets. Bake for 20 minutes. Place under broiler for the last 2-3 minutes for an even crispier outside. It's that time again where Girl Scout cookies are being sold. 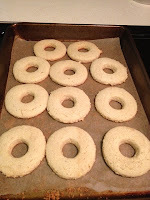 I wanted to make some of the cookies in a gluten free, healthier version for my kids to enjoy. I started with Samoas, these are a favorite by all of us and this version didn't disappoint. I even tested these out on some gluten eating people and they loved them. 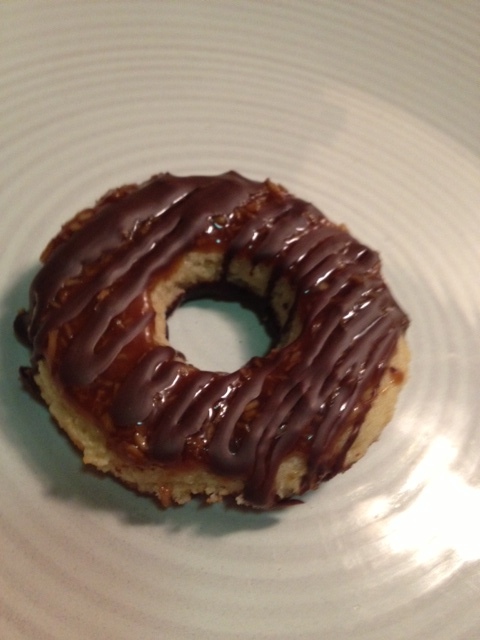 If Samoas are one of your favorite Girl Scout cookies I definitely recommend this recipe. This recipe was adapted from this recipe from Elana's Pantry. I used a caramel recipe from Paleo Indulgences by Tammy Credicott. If you are looking for a good paleo cookbook, this one is great. There are many recipes in here I can't wait to make. 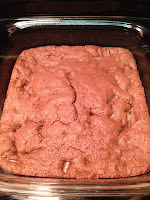 Here is the caramel recipe posted with permission from The Healthy GF Life. 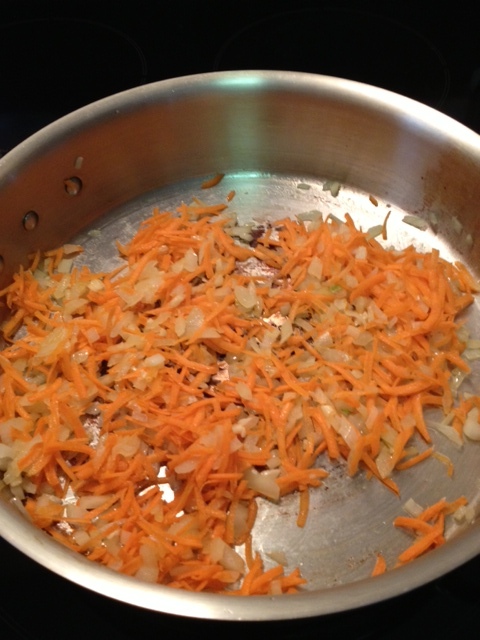 Place all ingredients in a medium saucepan and stir to combine. 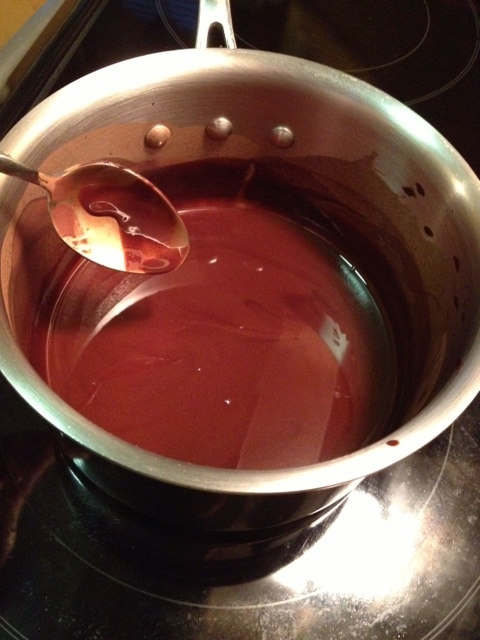 Heat over medium-high heat and boil mixture until it reaches 250 degrees on a candy thermometer. About 20 minutes. In a large bowl, combine dry ingredients (almond flour, baking soda and salt). 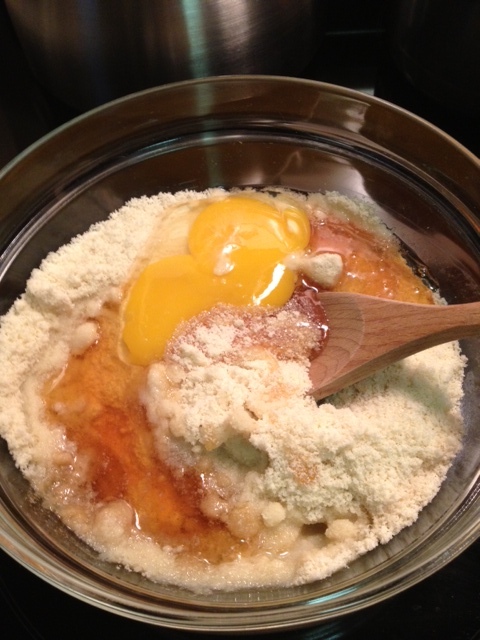 Add wet ingredients (honey, egg and coconut oil). Mix until well combined. Put in refrigerator for 1/2 hour. 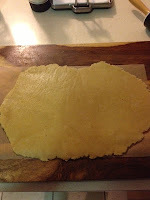 Remove from refrigerator and roll out between two pieces of parchment about 1/4 inch thick. Using two round cookie cutters. 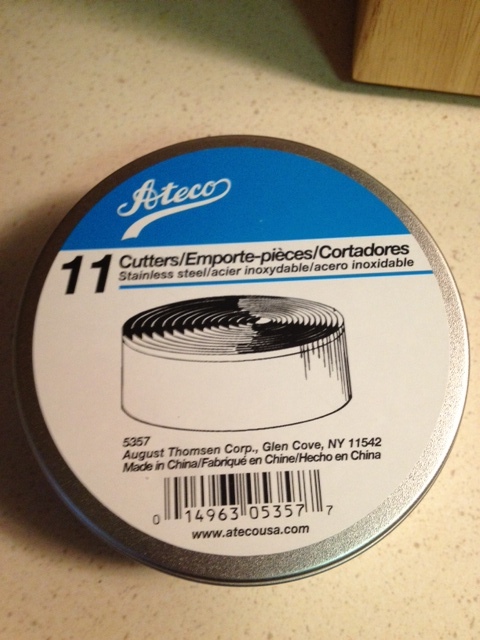 (I like my Ateco set), cut out 2 inch round cookies and then cut out the center with a smaller cutter. 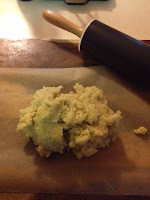 Keep re-rolling scraps of dough until all has been used up. Bake on parchment lined baking sheets at 350 degrees for 6-8 minutes. Melt your chocolate over a double boiler. 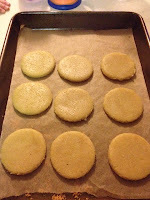 When cookies are cooled, dip bottoms in chocolate and place on wax paper and into the refrigerator to harden. While chocolate is hardening, make your caramel. Stir in toasted coconut. 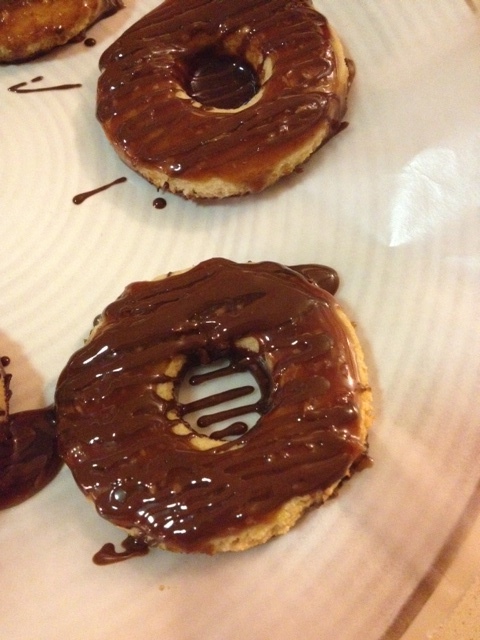 Spoon caramel onto tops of cookies and then drizzle with more melted chocolate. Put back in the refrigerator to harden. I found out my daughter was allergic to soy a little over a year ago. Once we found out, I made sure we didn't use any soy sauce in the house. Some of my recipes that called for soy sauce really did need it. I was very happy recently, when I found this product from Coconut Secret called coconut aminos. This is a really good replacement for soy sauce. Vegetable fried rice was one of my favorite Chinese takeout dishes. Now this version is not only soy free, but grain free, gluten free and dairy free too! 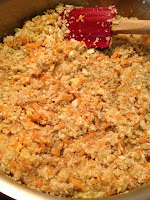 Using cauliflower as rice is a great way to get a rice textured dish and include another veggie in your meal. This recipe was inspired by this recipe from Detoxinista. 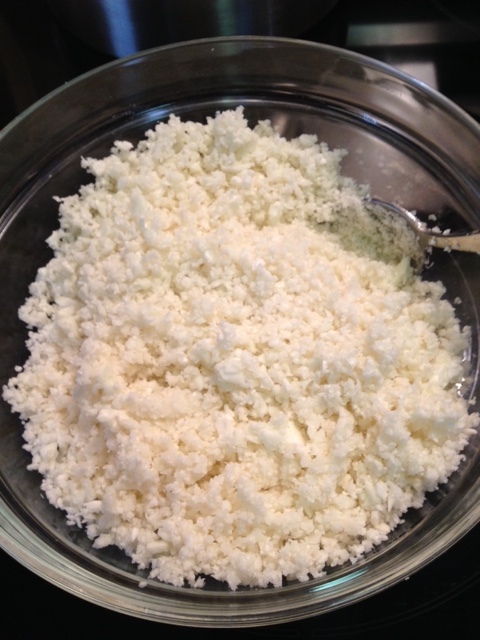 To make cauliflower rice, put cauliflower florets in a food processor in small batches and pulse into "rice". In a large skillet, on medium heat saute the onion in olive oil until softened. Add the garlic cook for about a minutes. 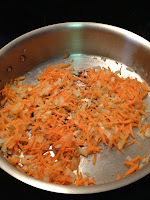 Add in the carrots and water and cook for about 5 minutes. 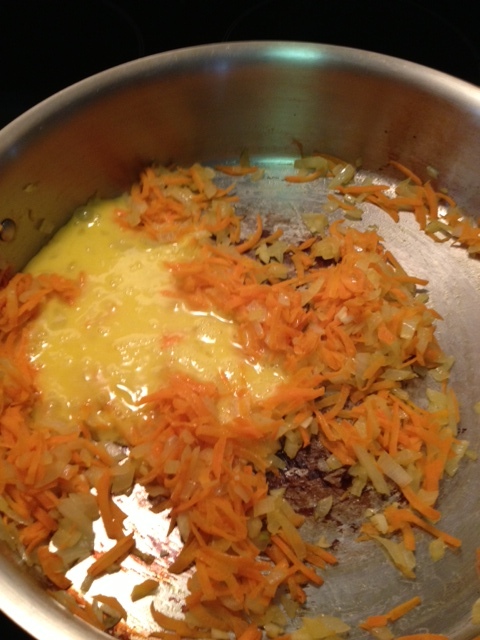 Add in the egg and stir around until egg is cooked. 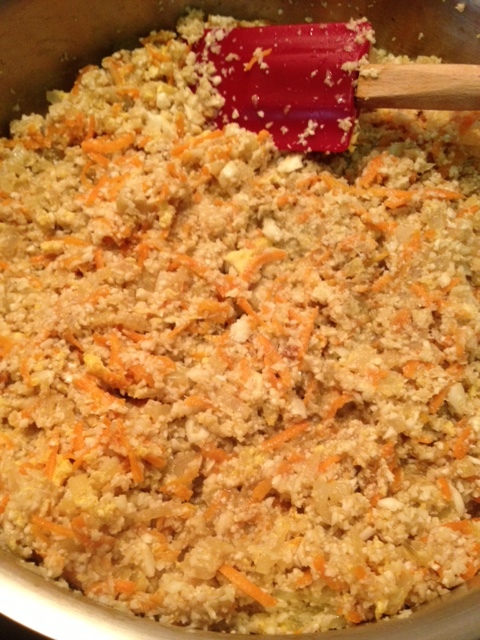 Add in cauliflower rice, coconut aminos and sea salt. This is another recipe from The Earth Diet that I would like to share with you. 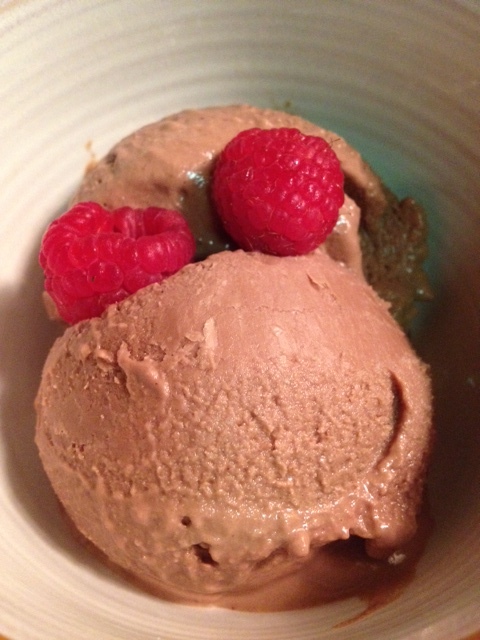 Ice cream is another one of my favorite desserts and this recipe from Liana at The Earth Diet makes it possible to have a healthy nutritious ice cream treat. I have made other raw nut ice creams, but so far I think that this walnut version is my favorite. Original recipe can be found here. Put ingredients into a powerful blender, I use the Vita-Mix. Blend until smooth and creamy. If adding any of the optional additions, stir them in after blending the ice cream. Transfer to a bowl and put in the freezer for a few hours (I left mine for 3 1/2 hours). Serve after freezing for a few hours for a soft serve type or freeze overnight for a harder ice cream. 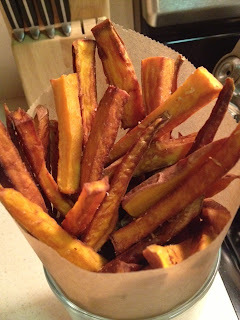 Sweet Potatoes are a favorite in my house. Usually I just bake them and enjoy them as is with a sprinkle of sea salt, cayenne or garlic. I never made homemade french fries, so when I saw this recipe from The Earth Diet, I figured they would be awesome and I was right! Cut your potatoes into french fries. Heat about 1/2 inch of coconut oil in a deep pan. Fry potatoes in batches until golden brown. Transfer to a dish and sprinkle with shredded coconut and sea salt. My kids have always been fans of waffles, but recently they started asking for pancakes. I've tried many gluten free pancake mixes and haven't been a fan of them. 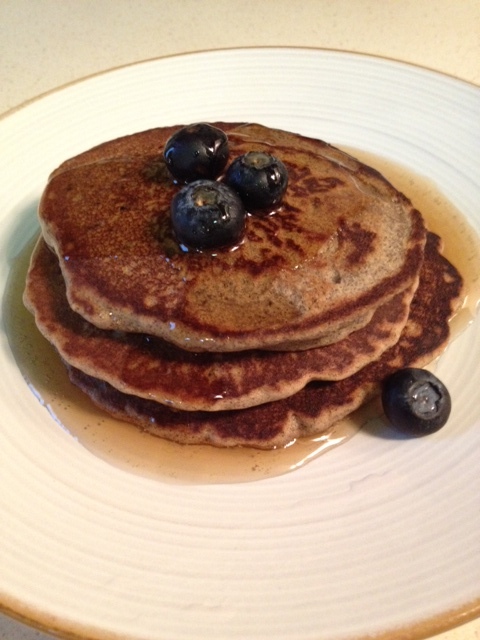 Buckwheat is very healthy and a good gluten free alternative to wheat flour. 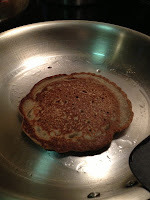 It makes a really fluffy pancake that was enjoyed by all. 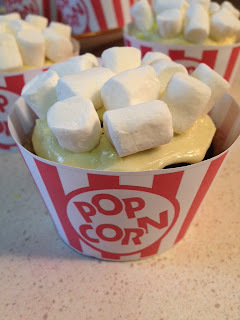 Even my husband who is not gluten free loved these. -Buckwheat has been found to lower blood pressure and cholesterol. Heat a griddle on medium until hot. Add coconut oil to the griddle to grease the pan. Mix dry ingredients together in a bowl, add wet ingredients and stir to combine. 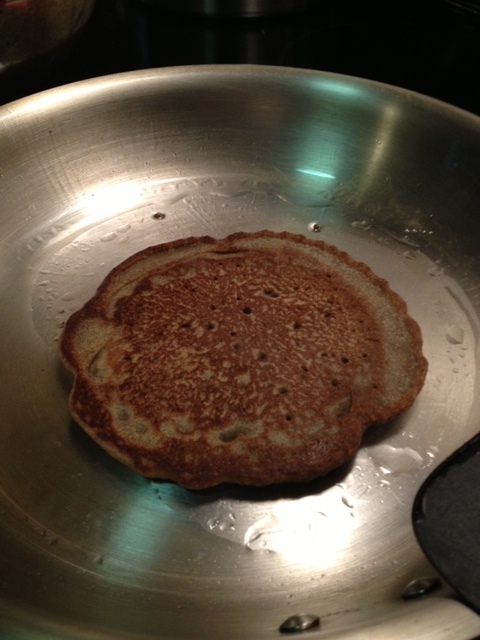 Scoop by 1/4-1/2 cups onto hot griddle. Cook on one side until small bubbles appear on the top, then flip over and cook the other side until lightly browned. Serve with maple syrup or fruit or both! I love coconut oil, I use it for everything. I use it to bake with, cook with, as a skin moisturizer and body lotion. This stuff is really amazing. 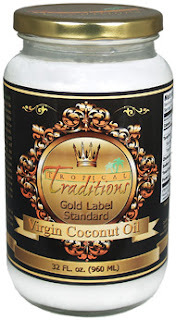 Tropical Traditions was nice enough to send me a quart of their Gold Label Virgin Coconut Oil for review. Ever since I received this bottle (and finished it), I have been buying it by the gallon from their web site. Now one of you can receive a complimentary quart for yourself, just enter below. Now is your chance to win 1 quart of Gold Label Virgin Coconut Oil! Just enter using our Rafflecoptor giveaway box. The contest will be closing on Saturday 1/18/13, so hurry and enter! The winner will be chosen at random. After I made this peanut butter blondie recipe last week (first posted about here). 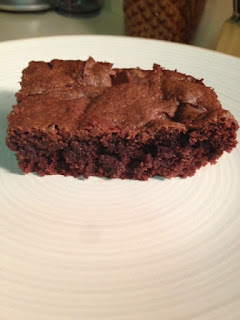 I wanted to make a chocolate brownie version especially for by hubby who LOVES brownies. He is not a fan of peanut butter, so I used almond butter to make these brownies and they came out amazing!! Preheat oven to 350 and grease an 8 inch square glass baking dish with coconut oil. 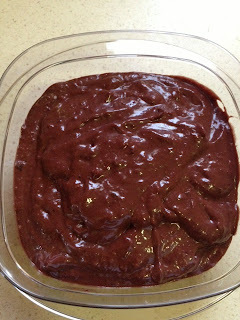 Mix the almond butter, egg, cacao powder, honey, baking soda and salt in a bowl until well combined. Fold in the chocolate chunks. Pour mixture into baking dish and smooth the top so that it is even. Bake for 20-25 minutes. I took mine out at 22 and they were perfect. Let cool, then cut and serve. They go really well with some homemade chocolate milk! I know a lot of kids drink chocolate milk and although even this healthy version should still be given as a treat, it is nutritious and much healthier than the pre-made chocolate milks or even the chocolate syrups added to milk. There is a ton of refined sugar and artificial flavors in most of those. This chocolate syrup is dairy free, sweetened with maple syrup, and made with only 4 ingredients plus water. You can add this to any milk that you drink, dairy or non-dairy (rice, hemp, almond, coconut). 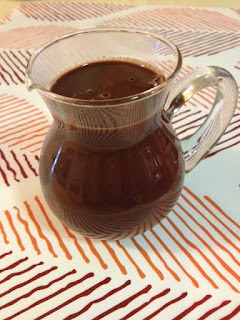 You can also use this chocolate sauce to top other desserts as well. It goes very well with fruit! This recipe was adapted from this recipe. Add water and raw cacao powder in a pot. Heat on medium until chocolate is melted. Continue to cook until boiling. Add sea salt and vanilla extract. Slowly stir in maple syrup and bring to a back to a boil. Let this boil for about 5 minutes until thickened. Keep stirring it. 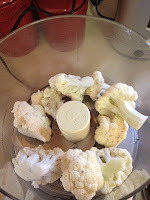 Remove from heat, let cool then transfer to a container and store in the refrigerator until ready to use. 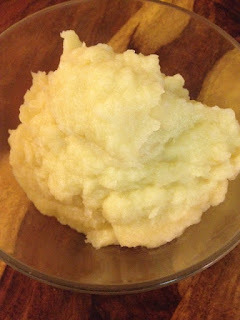 This recipe is great for anyone on a Paleo diet or anyone who wants to replace their traditional mashed potato side dish with something new. This is my favorite side dish served with a roasted chicken in place of mashed potatoes. Parsnips are high in soluble fiber, the type that helps lower cholesterol and keeps blood sugar leveled. They provide folic acid and potassium. Boil parsnips until soft. You should be able to push a fork through very easily. Drain in a colander, then add to a mini food processor. Puree the parsnips until smooth. 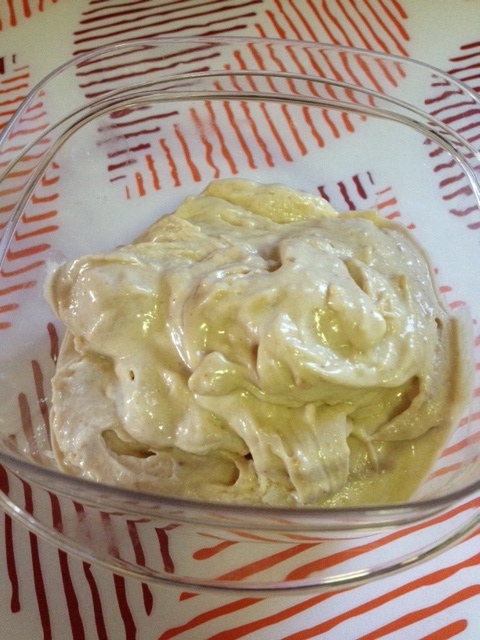 Drizzle in about two teaspoons of olive oil and process until combined. Season with salt, pepper and garlic powder. I am always bookmarking recipes that look good that I want to make. The list just keeps getting longer and longer! Since my kids love to cook and bake with me (and taste test) the week off between Christmas and New Years was the perfect week to make some of these recipes. I made a bunch of the recipes that I've bookmarked and I've listed the ones that I recommend making below. 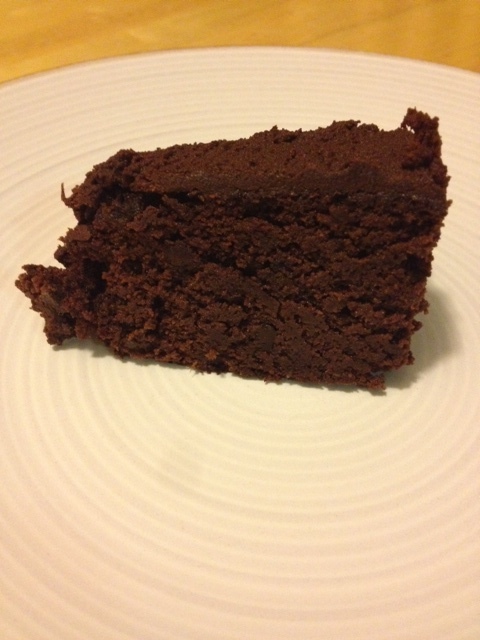 First, this chocolate paleo snack cake from Lea at Paleo Spirit has been on my list for quite some time now and I finally made it! The only things I did differently was I used hot water instead of the coffee that is called for in the recipe and added a 1/2 cup of Enjoy Life mini chocolate chips. Otherwise I followed the directions exactly. Mine took about 10 minutes longer than the 35 minutes it says. This cake is unbelievable! Even grain and gluten eating friends enjoyed this. 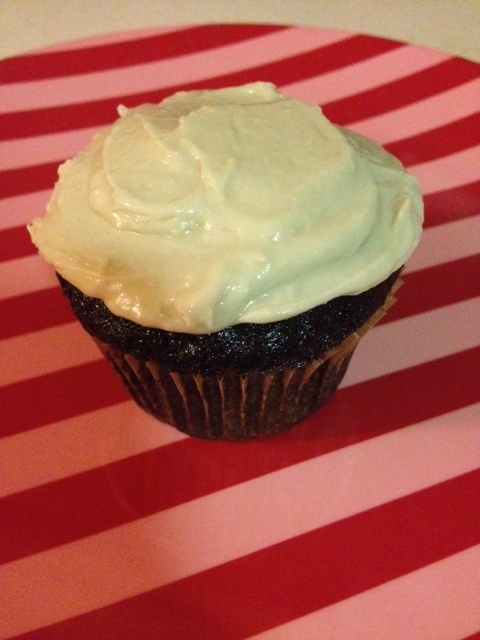 I frosted it with this chocolate frosting without the bacon. This is a super chocolaty and super moist cake. I will be making this again and again...it was THAT good! Next, I made these chocolate raspberry muffins from Megan at Detoxinista. 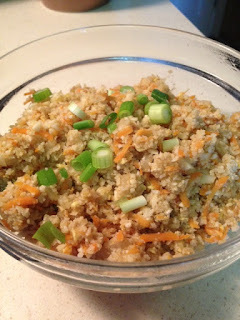 I just recently came across Megan's blog and I love her recipes, not only are they nutritious, but easy to make! This muffin recipe was a hit with the kids. 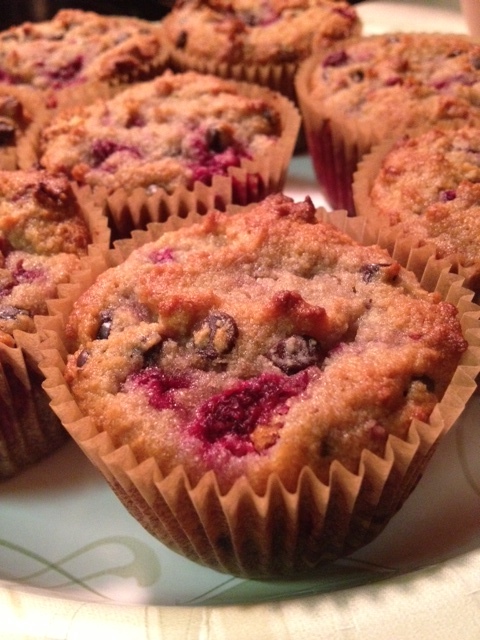 They are sweetened with honey, and get a little extra sweetness from the raspberries and mini chocolate chips. These are perfect for after school snacks, dessert or with a cup of tea. Now for one of my favorite combination...peanut butter and chocolate. Anything that combines them must be an awesome dessert! My peanut butter cups are one of my favorite desserts. 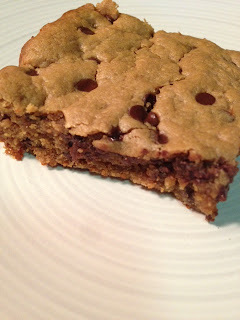 When I saw these blondies from Megan at Detoxinista I just had to try them! Not only do they combine peanut butter and chocolate, they are flourless, sweetened with honey and are so easy to make. These are amazingly good, so thick and chewy and good for you...it's hard to believe these are actually nutritious! These were really good right out of the oven and just cooled slightly, the chocolate was still gooey and the inside was chewy. Then I made this chocolate cherry pudding. There is another combination I love almost as much as peanut butter and chocolate and that is cherry and chocolate! I've made avocado puddings before, but when I saw this recipe from Megan at Detoxinista that added frozen cherries I thought that was a great idea. 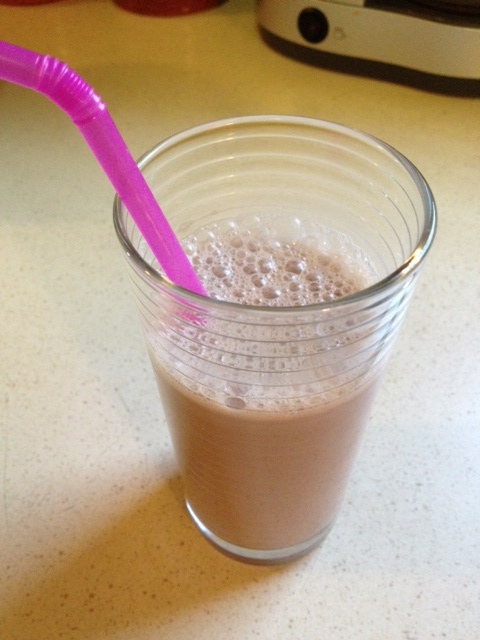 I made this with the almond milk option, used 2 tablespoons of maple syrup (no stevia), 3 tablespoons raw cacao powder and no almond extract. This was an awesome pudding, the cherry and chocolate combination was perfect. I have been experimenting with cake a lot recently. My daughter's birthday is next month and ever since we went gluten free, I have ordered her cake from a local health food store. This year I wanted to make my own cake. Although normally my desserts and treats are free of refined sugar, this cake is not. I do consider this a once in a while treat. 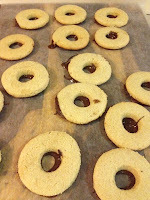 Now that I have this recipe, I will continue experimenting with this to remove the refined sugars. But, for now if you can eat sugar on occasion, this is an amazing cake. It reminds me of the super moist gluten filled chocolate cupcakes I had as a kid, and since those were in a box with ingredient lists that were super long and filled with all sorts of chemicals, I am happy about the clean ingredients in this cake. Makes 24 cupcakes or two 9 inch round cakes. 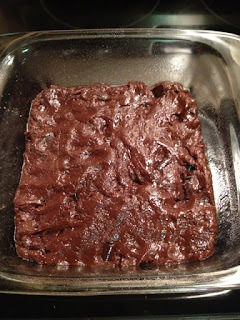 *This recipe was tried with both evaporated cane sugar and coconut sugar, coconut oil and safflower oil and all worked well. 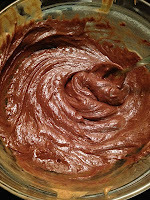 In a bowl mix together the flour mix, cacao powder, cane juice, salt, baking soda and xanthan gum. Add the coconut oil, vinegar, vanilla, egg and water. Mix until combined. Fold in the chocolate chips. 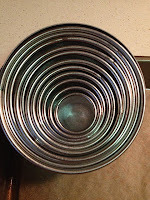 For the cupcakes, line a cupcake pan with liners and bake at 350 for about 25 minutes until a toothpick inserted comes out clean. For the cake, grease and flour two 9 inch round pans and bake at 350 for about 30-35 minutes until a toothpick inserted comes out clean. Put all ingredients in a bowl and blend with a hand blender or stand mixer. Mix at low for about 30 seconds then beat on high for about 1 minute until fluffy. If it seems to dry add rice milk a tablespoon at a time until spreadable consistency. If it seems too loose add more powdered cane sugar a tablespoon at a time until thickened. Additional info: This icing recipe is enough for the outside of the cake. If using it to fill the cake as well, you need to double the recipe. 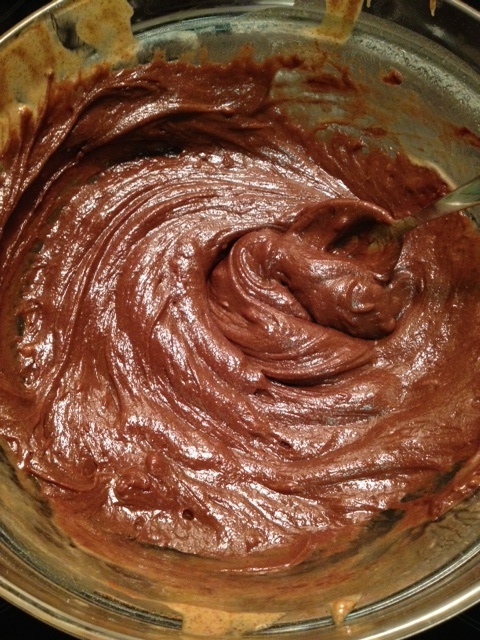 I usually make two batches and add some cacao powder to the second batch to fill the inside of the cake. 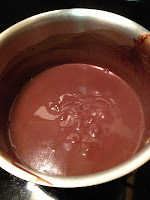 You can start with about 1/4 cup cacao powder and increase to your desired chocolate level. Put all ingredients in a bowl and blend with a hand blender or stand mixer. Mix at low for about 30 seconds then beat on high for about 1 minute until fluffy. If it seems to dry add rice milk a tablespoon at a time until spreadable consistency. If it seems too loose add more powdered cane sugar a tablespoon at a time until thickened. 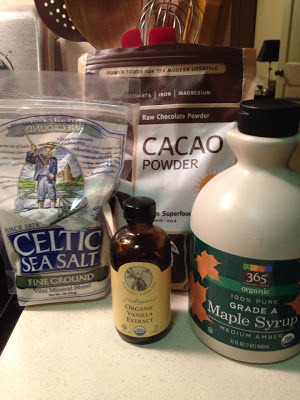 If you want it more dark chocolate add a little more cacao powder! Put all ingredients in a container and shake it up. Store until needed for recipes that call for gluten free flour mix. Banana Peanut Butter "Ice Cream"
This is so simple and healthy, but unbelievable good. If you cannot eat dairy this is a perfect ice cream replacement and if you can eat dairy, you will just want this instead because it is so good you won't be able to resist it! This recipe is adapted from this recipe from Megan at Detoxinsta. For a chocolate version, add 1-2 tablespoons of raw cacao powder. Put all ingredients into a food processor and process until smooth. If you want it more soft serve you can add a little more milk and serve right away. You can also put this into the freezer and let firm up and serve at a later time. I prefer the soft serve method but both are good. 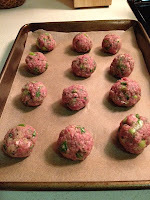 If you decide to put it in the freezer for later, take it out about 15 minutes before serving so it can soften up a bit!